← Flight 9252 that crashed on March 24 2015 with 150 dead…. Team “United” again! With all I have so far of the Germanwings crash of flight 9252 on March 24 2015, I am convinced the official story is not true. There is no reason to think Andreas Lubitz committed suicide taking 149 lives with him. Instead pilot Patrick Sonderheimer committed the act and framed Lubitz. Read a summary of my analysis here: link. Below a more technical analysis of the cargo door operations. I am by no means an expert, so analysing this case is more difficult than my own case. Since these terrorist events are too important to blindly trust the formal story, I feel obliged to try nonetheless. Any expert in the field is encouraged to bring in knowledge. Below some questions, based on what I found so far. The cargo doors can only be opened from outside, when the plane has landed and is standing still. For safety, whenever the cargo doors are opened, operations in the cockpit to steer the plane are limited. We do not want a pilot to manoeuvre around, when someone is loading or unloading the cargo at the airport. On the other hand, it is not possible to open the cargo door mid flight. However, I think that is exactly what they did. Is there anyone who can help me out here? What is the impact of opening the cargo door? 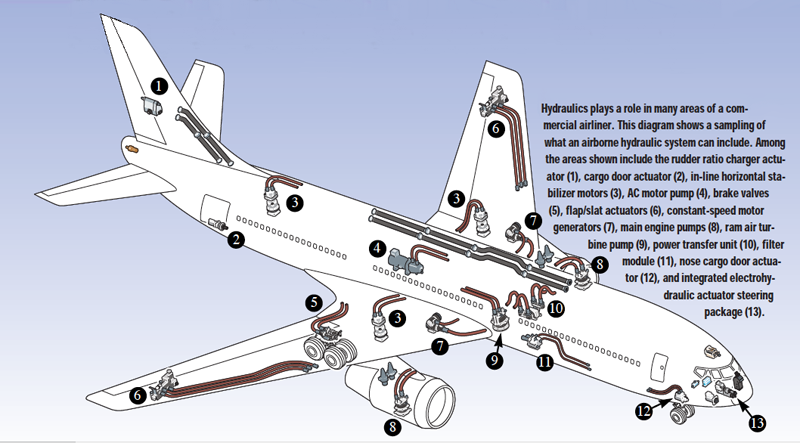 Many parts of the A320 airplane are operated using hydraulic mechanisms [picture right is an example]. 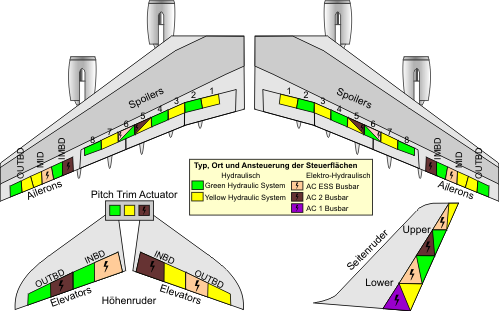 There are three hydraulic flow circuits in the A320, of which the fluid flow is seperated: green, blue, and yellow. These 3 hydraulic systems provides hydraulic pressure to operate the: Flight controls; Slats and flaps; Landing gear/Brakes/Nosewheel steering; Cargo doors; and the Production of electrical power with an emergency electrical generator. The fluids circuits in these three systems are always seperated, but the three systems do provide eachother back-up power (link). The two pictures to the right are examples of hydraulic systems in an aircraft (different types of planes, not the Airbus A320). The hydraulic system is (besides for the cargo doors) also used to control the direction of the plane, by steering its wings, tail and brakes. 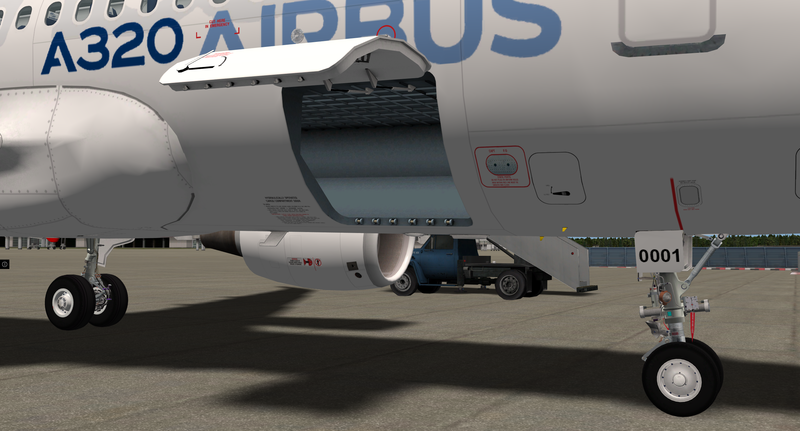 In an A320, the cargo doors can only be opened (a) from the outside, and (b) when the aircraft is standing still. They are operated by the water pressure in the “yellow system”. The yellow system is pressurized by an engine driven pump on engine number 2 (the green system is on engine 1). The yellow system is pressured by the hydraulic power coming from engine 2 and also has (as backup) an electrically driven hydraulic pump. When both do not work in the yellow system (for instance when the plane is standing still and there is no AC power), a hand pump provides backup pressure to the yellow hydraulic system specifically to operate the cargo doors. This handpump is to be operated from outside the plane and is solely meant to open the cargo door (from the outside) when the operating systems in the airplane are down (generally speaking: the plane has landed, both engines are off, and cargo doors need to be opened, yet the AC power doesnot work). What happens when someone is able to open the cargo door, somehow, mid flight? How can an A320 be adjusted so that the manual handles to open the cargo door (positioned outside the plane) are in fact operated from inside the cargo storage unit? What would it take to simply (brutally) open the door with force mid flight? Opening of a cargo door would normally only happen when standing still in an airport. For safety, when opening the cargo door, normal cockpit activities to operate the plane are blocked. So when someone somehow would be able to open the cargo door mid flight, does that mean some cockpit steering mechanisms are no longer operational? When the yellow hydraulic system is blocked (cargo door is open), does it mean water pressure remains as it is and thus steering gear remains in a fixed position, e.g. exactly like it was the moment it is blocked? What is needed to make these adjustments without suspicions? 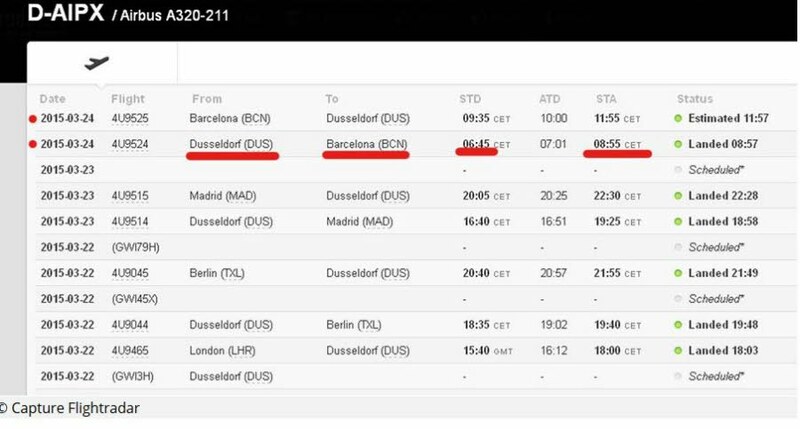 Bring on board the ejection cabin in Barcelona? Make some preps to sabbotage the cargo door? From what I understand, the yellow system switches automatically to the electric hydraulic pump when the cargo doors are operated, provided AC power is available (if no AC power is available, there is the hand-pump). Also, an inhibition system prevents the operation of all other components powered by the yellow hydraulic system, except for the cargo doors. I am by no means an expert in this area. To me it seems the cargo door system is designed, so that it can not be opened when in the air. Also, it is designed so that when someone is opening the cargo doors (which theoretically can only happen when on the ground), in the cockpit one can no longer change the direction of the plane? My quess is, terrorists who sabotage a plane, are able to open the cargo door somehow mid air. The main question is: would that limit any last attempts of a crew member to steer the plane upwards and avoid the mountain? In this module, we will cover the hydraulics system installed on the A320. We will start out with a general overview of the hydraulics system. Next, we will cover each system in detail. We will then look at the controls and indications associated with the hydraulic system. A validation exam will conclude this module. * Produce electrical power through a hydraulically driven emergency electrical generator. The hydraulic system is divided into three systems. These are called the GREEN, BLUE, and YELLOW hydraulic systems. The hydraulic system is designed so that there is no interchange of fluid between the three systems. This arrangement segregates the three hydraulic systems from each other. Each hydraulic system has its own reservoir. Hydraulic pumps supply hydraulic pressure at 3000 PSI. The GREEN system is pressurized by an engine driven hydraulic pump. This pump is turned by engine number 1. The YELLOW system is also pressurized by an engine driven pump, this one driven by engine number 2. A Power Transfer Unit, or PTU, enables the GREEN system to pressurize the YELLOW system, and vice-versa. There is no interchange of fluid. The YELLOW system incorporates a backup electrically driven hydraulic pump. The BLUE hydraulic system is pressurized by an electric hydraulic pump. A Ram Air Turbine, or RAT, can provide back up hydraulic pressure source to the BLUE hydraulic system. This RAT consists of a hydraulic pump which is driven by a propeller. When RAT hydraulic pressure is required, the RAT is extended into the air stream, and the propeller drives a shaft which, in turn, drives a hydraulic pump. A hand pump provides backup pressure to the yellow hydraulic system when no electric power is available. This pressure is used to operate the cargo doors. The hydraulic system is monitored by the Hydraulic System Monitoring Unit, or HSMU. Hydraulic system information is displayed on the Hydraulic ECAM page. The controls and indicators associated with the hydraulic system are on the Hydraulic panel, located on the cockpit overhead panel. We will now take a detailed look at the hydraulic system. We will start with a description of the GREEN hydraulic system. The GREEN hydraulic system is supplied from its respective hydraulic reservoir. In order to avoid pump cavitations, pneumatic air is used to provide a head pressure which prevents foaming of the hydraulic fluid. * The flight control surfaces. GREEN hydraulic pressure is provided by an engine driven hydraulic pumps. The pump is driven by engine number 1. GREEN hydraulic pressure is available anytime the number 1 engine is running, provided the associated fire shutoff valve is open. The engine driven hydraulic pump supplies approximately 3000 PSI of pressure. The GREEN engine driven hydraulic pump is controlled by the ENGine 1 PUMP pushbutton, located on the Hydraulic control panel. In addition, the GREEN hydraulic system can be pressurized by the Power Transfer Unit, or PTU. The PTU uses hydraulic pressure in the YELLOW system to drive a pump in the GREEN system, thereby pressurizing the GREEN hydraulic system. The PTU will operate in the event there is a pressure differential between the GREEN and YELLOW systems. A fire shutoff valve is located between the GREEN hydraulic reservoir and the engine driven hydraulic pump. This valves is closed by pressing, and releasing the engine 1 fire pushbutton, located on the engine fire control panel. In the event of an engine fire, the hydraulic fluid will not be supplied to the GREEN engine driven hydraulic pump. An accumulator, located downstream of the engine driven hydraulic pump, provides dampening during pressure fluctuations. The accumulator is pressurized by the engine driven hydraulic pump. We will now look at the BLUE hydraulic system. The BLUE hydraulic system is supplied from its respective hydraulic reservoir. In order to avoid pump cavitations, pneumatic air is used to provide a head pressure which prevents foaming of the hydraulic fluid. The BLUE system does not incorporate a priority valve. BLUE hydraulic pressure is provided by a single electrically driven hydraulic pump. This pump supplies approximately 3000 PSI of hydraulic pressure. Unlike the GREEN and YELLOW systems, the BLUE system does not have a fire shutoff valve between the BLUE hydraulic system reservoir, and the electric hydraulic pump. * AC Bus 1 is powered. In flight, the BLUE system hydraulic pump operates when the elctrical system is normally configured. The BLUE electrically driven hydraulic pump is controlled by the guarded ELECtric PUMP pushbutton, located on the Hydraulic control panel. A Ram Air Turbine, also known as the RAT, can also pressurize the BLUE hydraulic system. This RAT is mounted in parallel to the electric hydraulic pump. The RAT is used to pressurize the BLUE electric system in the event of an electrical power loss, or a dual engine failure. When the RAT is extended, the attached hydraulic pump will be able to draw hydraulic fluid from the BLUE hydraulic reservoir. The RAt can provide a nominal system pressure, provided the aircraft speed is above a certain limit. The RAT is only used to provide emergency hydraulic pressure, and, in the case of an electrical emergency, drive a hydraulic motor which runs an emergency electrical generator.. The RAT is mounted in the lower fuselage, near the left wing root. The minimum airspeed for proper RAT operation is 140 knots. The RAT is controlled by the red guarded RAT MAN ON pushbutton, located on the Hydraulic Control Panel. Lifting the guard and pressing the RAT MANual ON pushbutton will deploy the Ram Air Turbine. The RAT can be extended when the aircraft is on the ground, or in flight. Once deployed, the RAT can only be stowed when the aircraft is on the ground. The RAT can also deploy automatically when the aircraft is in flight. In flight, the RAT will automatically deploy when the aircraft is in the emergency electrical configuration. This will be covered during the electrical module. Once the RAT is deployed, the E/WD will display the RAT OUT message. It should also be noted that you can manually deploy the RAT by pressing the EMERgency ELECtrical pushbutton, on the electrical control panel. However, this action connects the emergency electrical generator to the essential AC and DC buses. Due to this, it is not recommended to use this method to deploy the RAT in the event of a hydraulic malfunction. * A failure of the Ram Air Turbine, following the failure of the BLUE electric hydraulic pump. In the event of a failure of the BLUE electric Hydraulic pump, the RAT can be deployed and used to provide hydraulic pressure to the BLUE hydraulic system. The RAT does not automatically deploy in the event of a failure of the BLUE electric hydraulic pump. In the event the BLUE hydraulic system reservoir is depleted, the electric hydraulic pump will have to be shut down, and you will not be able to use the RAT for backup power. A BLUE reservoir overheat will require the shut down of the BLUE electric hydraulic pump. In this case, the pump can be restarted after the overheat condition has been corrected. The BLUE hydraulic system can remain unpressurized as long as the other two hydraulic systems are pressurized. We will now look at the YELLOW hydraulic system. The YELLOW hydraulic system is supplied from its respective hydraulic reservoir. In order to avoid pump cavitations, pneumatic air is used to provide a head pressure which prevents foaming of the hydraulic fluid. The YELLOW hydraulic system does not incorporate a priority valve. * A hand pump can be used to pressurize the YELLOW system to open the cargo door. An accumulator located downstream of the various pressure sources supplies hydraulic pressure when the pump is unable to meet transient system demands. The primary means of pressurization of the YELLOW hydraulic system is an engine driven pump, driven by engine number 2. A fire shutoff valve is located between the YELLOW hydraulic reservoir and the engine driven hydraulic pump. This valve is closed by pressing, and releasing the engine 2 fire pushbutton, located on the engine fire control panel. In the event of an engine fire, the hydraulic fluid will not be supplied to the YELLOW engine driven hydraulic pump. The YELLOW engine driven hydraulic pump is controlled by the ENGine 2 pushbutton, located on the Hydraulic control panel. An electric hydraulic pump can also supply hydraulic pressure to the YELLOW system. Hydraulic fluid is supplied to this electric pump prior to the hydraulic pump fire shutoff valve. Therefore, in the event of an engine 2 fire, the YELLOW hydraulic system will be able to be pressurized, even though the engine 2 hydraulic pump is no longer operational. The YELLOW electric hydraulic pump is controlled by the electric hydraulic pump pushbutton, on the hydraulic control panel. In addition, the YELLOW electric hydraulic pump will automatically activate when the cargo doors are operated, provided AC power is available. However, an inhibition system prevents the operation of components powered by the YELLOW hydraulic system, except for the cargo doors. In the event AC power is not available, the YELLOW hydraulic system incorporates a hand pump which enables the pressurization of the YELLOW system to operate the cargo doors only. This hand pump is accessible from a panel located on the exterior of the aircraft. In addition, the YELLOW hydraulic system can be pressurized by the Power Transfer Unit, or PTU. The PTU uses hydraulic pressure in the GREEN system to drive a pump in the YELLOW system, thereby pressurizing the YELLOW hydraulic system. The PTU will operate in the event there is a certain pressure differential between the GREEN and YELLOW systems. The PTU and engine driven pumps should not be used in the event of a low level reservoir in either the GREEN or YELLOW systems, a reservoir overheat or reservoir low air pressure in either of these two systems. Under these circumstances, FAULT lights will illuminate in the PTU and affected engine pump pushbuttons, and the engine driven pump nor the PTU should not be used. They should be selected OFF if they are in use. If the YELLOW electric hydraulic pump is supplying the pressure when one of these malfunctions occurs, then the YELLOW electric pump pushbutton will have an illuminated FAULT light, and the pump should be selected OFF. If the fault was due to a reservoir overheat, then the affected engine pump and PTU can be turned ON. The PTU can be used to pressurize a system, even if the fire shutoff valve is closed. We will now look at the controls and indicators associated with the hydraulic system. The Hydraulic ECAM page indicates the status of the various components of the hydraulic system. We will now look at each component. The Hydraulic reservoir quantity is displayed at the bottom of the Hydraulic page. The indication consists of a pointer against a white, vertical scale. The green pointer indicates the hydraulic quantity in the particular reservoir. A green box near the top of the scale indicates the normal reservoir fill level. This quantity is corrected for temperature variations, and in the event the temperature correction is inoperative, the green box is displayed in white. The hydraulic quantity indications change colors when the fluid level drops below the low fluid level. In this case, the fluid level pointer changes from green to amber, the white vertical scale changes to amber, and a HYDraulic ReSerVoiR LOw LeVeL message is displayed in the E/WD. This message will also indicate which hydraulic system is affected. In addition, the Hydraulic page is automatically displayed. An amber OverHeaT message is displayed near the bottom of the affected reservoir indication in the event of a reservoir fluid overheat. In addition, the E/WD displays a HYDraulic ReSerVoiR OVerHeaT message. A LOw AIR PRESSure amber message is displayed near the affected reservoir indication in the event the reservoir head pressure is below a certain limit. In addition, the E/WD displays a HYDraulic ReSerVoiR LOw AIR PRessure. The position of the engine fire shutoff valves is displayed immediately above the GREEN and YELLOW reservoir indications. The valve is displayed in green, with an in-line, when the associated fire shutoff valve is not fully closed. It is displayed in amber, with a cross-line when the associated fire shutoff valve is fully closed. The engine driven hydraulic pumps are represented by a square with a line within the square. A green, in-line square indicates that the associated hydraulic pushbutton is ON and the hydraulic pressure is normal. An amber, cross-line square indicates that the associated pushbutton is OFF. An amber square with a LOw label indicates the associated engine hydraulic pump pushbutton is ON, and the pressure is low. The E/WD displays a HYDraulic ENGine PUMP LOw PRessure message. The engine number is normally displayed in white, next to the associated engine driven hydraulic pump. They are displayed in amber when the associated engine is not running. The representation for the electric pump in the BLUE system is identical to the engine driven pump indications. The only difference is the white ELECtric label. The electric hydraulic pump in the YELLOW system is indicated by a triangle labeled ELECtric. The color of the triangle and label indicates the status of the associated electric hydraulic pump. The ELECtric label is displayed in amber in the event of a failure of the power supply to the pump. A white, hollow triangle, and label, indicates that the associated electric hydraulic pump is not commanded to run. A solid green triangle, with a white electric label, indicates that the associated electric hydraulic pump is ON, and it is supplying normal pressure. A amber, solid triangle indicates that the associated electric hydraulic pump is commanded to run, but the output pressure is low. An amber, hollow triangle, with an amber ELECtric OVerHeat label, indicates that the associated electric hydraulic pump has automatically shutdown due to an overheat. In addition, the vertical line, adjacent to the triangle, connecting the engine driven pump to the pressure indication will no longer be displayed. The status of the Ram Air Turbine is indicated by a triangle labeled RAT. A white, hollow triangle with a white RAT label indicates that the Ram Air Turbine is stowed. A solid, green triangle and a white RAT label indicates that the RAT is not stowed. A solid amber triangle and amber RAT label indicate that the RAT is not available. The E/WD displays a green RAT OUT message when the RAT is not fully stowed when the aircraft is in flight. An amber RAT OUT message is displayed in the E/WD when the RAT is not fully stowed when the aircraft is on the ground, prior to takeoff power application. The line labeled PTU represents the status of the PTU. This indication is located between the GREEN and YELLOW systems. Green arrows pointing away from a white PTU label indicate that the PTU pushbutton is in the AUTO, or armed position, but the PTU is not supplying pressure to either system. This would be the normal indication when both engines are running. The line and arrows are displayed in amber when the PTU pushbutton is in the OFF position. Green arrows, a green line, and a green PTU label indicate that the PTU is operating. The arrows point to the hydraulic system being pressurized by the PTU. In this example, the GREEN system is using the PTU to pressurize the YELLOW system. The E/WD displays a green HYDraulic PTU message when the PTU is running. The pressure within each hydraulic system is displayed at the top of the hydraulic page. The numerical indication is displayed in green if the associated system pressure is normal. The indication is displayed in amber if the pressure is below a certain value. The system label – green, blue, or yellow, is displayed in white, and the associated distribution triangle is displayed in green if the associated hydraulic system pressure is normal. Both the label and the distribution triangle turn amber if the associated hydraulic system pressure decreases below a certain value. There is an exception to this logic. When the yellow hydraulic electric pump is operating for cargo door operation, the numerical system pressure is displayed in green. However, the yellow label, and the associated distribution triangle, will be displayed in amber to indicate that only a portion of the yellow system is powered. The E/WD displays an amber SYStem LOw PRessure message in the event the system pressure in a particular system is low. The message identifies the affected hydraulic system. In the event of there is a low pressure in two hydraulic system, the E/WD will display a red SYStem LOw PRessure message. The message will identify the affected hydraulic systems. The Master warning lights flash in the event this message is displayed. The controls for the hydraulic system are located on the Hydraulic control panel, on the cockpit overhead panel. The engine driven hydraulic pumps are controlled by the ENGine 1, or 2, pushbutton for the respective hydraulic system. In the ON position, the respective pump is operating when the associated engine is running. Selecting the OFF position will cause the associated pump to depressurize. No hydraulic pressure will be produced, even though the pump continues to turn. The OFF light illuminates in the pushbutton to indicate that it has been selected OFF. * Low fluid level in the associated reservoir. * The associated reservoir overheats. * The associated pump pressure is low while the aircraft is on the ground and the associated engine is running, or anytime while in flight. The fault light is inhibited when the aircraft is on the ground and the associated engine is not running. The FAULT light extinguishes when the associated pushbutton is selected to the off position. However, if the fault is due to a reservoir overheat, the FAULT light will remain illuminated as long as the reservoir overheat condition exists. The BLUE electric hydraulic pump is controlled by the guarded electric pump pushbutton, also located on the hydraulic control panel. This pushbutton is normally in the AUTO, or lights out position. In the AUTO position, the BLUE electric hydraulic pump is always energized while the aircraft is in flight, provided AC power is available. The pump will start to run on the ground when at least one engine is operating, provided AC power is available. * The associated pump pressure is low when an engine is running on the ground, or anytime in flight. The fault light is inhibited when the aircraft is on the ground and the associated engine is not running. The E/WD displays a HYDraulic ELECtric PUMP FAULT message. The FAULT light extinguishes when the associated OFF pushbutton is selected to the off position. However, if the fault is due to a reservoir overheat, the FAULT light will remain illuminated as long as the reservoir overheat condition exists. A guarded BLUE PUMP OVeRiDe pushbutton, located on the overhead maintenance panel, provides a way to operate the BLUE system electric pump when the engines are not running. In the normal, lights out position, the BLUE electric pump will operate when an engine is running. Lifting the guard, and selecting the ON position will energize the BLUE electric hydraulic pump, even if none of the engines is running. The YELLOW electric hydraulic pump is controlled by the electric pump pushbutton, also located on the hydraulic control panel. This pushbutton is normally in the OFF, or lights out position. In the OFF position, the YELLOW electric hydraulic pump will be automatically energized when the cargo door manual selector valve is moved. The PTU and flight controls will be inhibited in this situation. In the ON position, the YELLOW electric hydraulic pump is energized, and the flight controls and flaps will be pressurized, even if the engines are not running. They will be pressurized by the YELLOW and GREEN systems, via the PTU. * The associated pump pressure is low. The red guarded RAT ON pusbutton is used to manually deploy the RAT. The RAT is stowed when the pushbutton is in the guarded position. Lifting the guard, and pressing the RAT MAN ON pushbutton deploys the RAT. The RAT will automatically deploy while in flight when AC bus 1 and 2 are not powered. In this case, the emergency generator will be operating. The PTU is controlled by the PTU pushbutton, on the overhead hydraulic control panel. This pushbutton is normally in the AUTO, or lights out, position. This will cause the PTU to automatically operate when there is a certain pressure differential between the GREEN and YELLOW systems. * The cargo doors are being operated. * During the first engine start, and when only one engine is operating while the aircraft is on the ground. * The tow bar is attached. After the second engine master switch is placed to ON, the PTU performs a self-test, and it will automatically enter the AUTO mode following a successful test, provided the PTU pushbutton is in the AUTO position. The ECAM will not inform the crew in the event the PTU fails the self-test. The crew will become aware of the problem only if there is a subsequent GREEN or YELLOW hydraulic pump failure. The indication on the ECAM Hydraulic page is that the PTU is not operating as expected. Placing the PTU pushbutton to the OFF position will deactivate the PTU. This concludes the Hydraulic module. The following questions should be answered to validate this module. This entry was posted in aanslag, Flight 9252 and tagged 9252, A320, blauw, Blue, cargo, doors, electric, engine 2, geel, green, groen, hydraulic, mechanism, operation, power, system, technology, water pressure, yellow, yellow system. Bookmark the permalink.